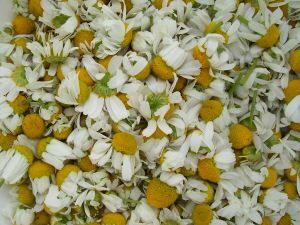 Chamomile Essential oil.Creating blends, uses of essential oils, soap making. Interesting Facts about Chamomile Essential Oil. Both Roman Chamomile and German Chamomile are discussed here. Roman Chamomile is known as Chamaemelum nobile, English Chamomile or Anthemis noblis. 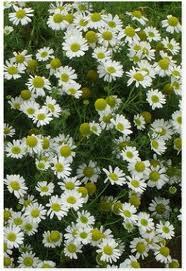 German Chamomile or wild Chamomile is known as Matricaria reutica, Blue or Hungarian chamomile or scented Mayweed. 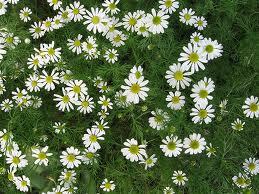 The word chamomile is derived from the Greek word "chamaimilo" meaning earth-apple. Chamai meaning on the ground and milo meaning apple. 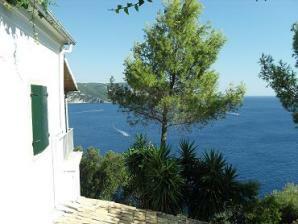 The plant is low-growing and mat-forming and has apple-scented leaves and flowers hence the association. The first documented use of the herb is by the Ancient Egyptians in the Ebers Papyrus of 1550 BC which is one of the oldest preserved documents pertaining to Ancient Egyptian medical history. It states that use of the chamomile herb alleviates gastro and intestinal tract disorders, reduces the effects of fever and has a calming, soothing effect. Throughout Ancient Egypt chamomile was used as a component in the embalming process, used in the mummification of the deceased. During the process of mummification plants were offered to the Sun god as a divine offering to ensure safe passage into the afterlife. Hippocrates " the father of Greek medicene " believed the herb to be most effective at treating dysmenorrhea and congestion. Herbs - taken in the form of a paste with other herbs, fennel, crab-apple, nettle and plantain, mixed with ashes, egg and apple-juice - this was placed in the mouth, ears and wound of the afflicted person and incantations sung and chanted, to cure and guard against infection. Maythen as it was known was also regarded as the plants physican - planting it beside ailing or drooping plants to enliven and revive them, a practice which continues to this day, as does its usage in lightening and conditioning fair hair and soothing irritated skin. The monks at this time used it as a bittering agent before the advent of hops. 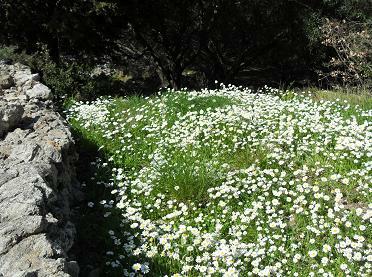 The Romans had adopted the use of chamomile and drank great quantities of what was early tisanes, also it was used as a type incense to purify and cleanse. In the Elizabethan era this dainty herb was liberally strewn upon the floor to release its sweet scent, it was used in pot-pourri and tussie-mussies (fragrant posies) and as a dye and freshner for clothing. The Elizabethans loved this sweet smelling flowering herb so much they planted chamomile lawns and seating areas in order that the fragrance was released when it was sat or walked upon,(the most famous Chamomile lawn still in exsistence today dating from the reign of Edward Fifth is the one at Buckingham palace).Chamomile was even smoked by the Elizabethans,in order to prevent insomnia, before tobacco reached English shores. Today this gentle herb and chamomile essential oil is still very much in worldwide use, known for its ability to soothe and calm,in particular sore inflammed skin. It continues to be drunk as a herbal tea aiding digestion and promoting restful sleep. In the pharmaceutical industry chamomile essential oil is used in antiseptic ointments and for carminative and anti-spasmodic preparations. In the cosmetic and beauty industry it is used in soaps, bath products, hair products, perfumes and fragrances. Finally in the food industry it is used in alcohol and soft drinks. Latin name - Anthemis nobilis. Perennial herb. 25 cm high. Feathery pianate leaves - white flowers with yellow centres, larger than that of the matricaria. Scent of apples when herb is crushed. Indigenous to Great Britain also native to Southern and Western Europe. Chamazulene, pinene, farnesol and cineol. Steam distillation of the flowerheads produces a pale blue liquid which later turns greenish-yellow, it has a sweet, fruity and herby smell. Description of the plant, its family and source. Latin name - Matricaria recutica. Annual herb. 60 cm high. Delicate, feathery, serrated leaves. White flowers with yellow conical centers. Native to Europe and North West Asia - grown extensively in Hungary and Eastern Europe. Chamazulene which is produced in the distillation process. Steam distillation of the flowerheads produces a deep blue oil. Why not try making soap using Chamomile Essential Oil ? Follow the links below to discover how to use essential oils in your home, for beauty and health,for cooking, for cleaning, in soapmaking and also how to grow herbs. This wonderful,bright and cheerful herb deserves a place in everyones home. Why not go to the Make Soap page,see the link below to try some more easy Olive Oil based recipes. Go to Making homemade Chamomile and Lavender Soap from this page. Do you have a favorite soap recipe or pictures that you would like to share ? Keep in touch with all that's happening at Anayennisi Aromatics - subscribe to the blog today !